What is ‘transformation’ in South Africa’s public interest legal services sector? Reform is crucial to change the silent messaging that black people, people living with disabilities and other marginalised groups, are inferior to the able-bodied, heteronormative white people in the sector. Black Workers Forum, Bertha Foundation. All rights reserved. Public interest law plays a crucial role in South Africa’s constitutional democracy. It has been instrumental in ensuring that the state is held to account for the way in which it delivers on its constitutionally enshrined mandate. However, one thing that the public interest law sector has not done is to champion the transformation of the legal services sector itself. For a while, no-one has been holding the sector to account. 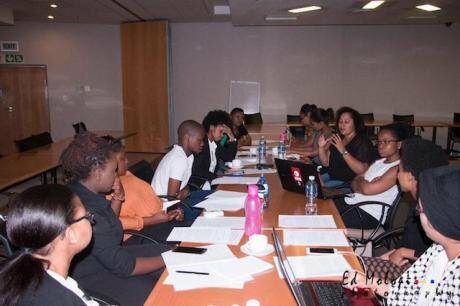 In August 2016 a group of young black professionals working for various public interest organisations, decided to do the unthinkable and take their concerns about the barriers faced by black workers in the sector to those leading and funding the sector. The Public Interest Law Gathering Young Professionals, later known as the Black Workers Forum (“the BWF”), demanded transformation in the sector. They did this through submitting a list of ten demands to the management of the sector and approaching donors at the Public Interest Law Gathering (PILG) held at the University of Witwatersrand with the same demands. PILG is an annual platform for public interest organisations to deliberate on, share experiences and generally promote the work of public interest organisations. The transformation of the legal profession had come up on a number of occasions over some years, and young black professionals had even been invited to speak about their experiences of the legal profession. The topic as it was discussed at PILG often contained a critique of the “mainstream” legal profession and the Bar. However, not much was said about the situation of black legal professionals in particular and black workers in general in the sector. The decision to look within only occurred once the BWF had raised these issues in their list of demands. This list of demands was prompted by persistent structural inequalities that plague black workers who provide their labour to the urban-based public interest law organisations. It is close to impossible for black workers in the sector to separate their welfare from the welfare of the communities they serve, most of which are black and poor. And the challenges faced by black workers seem secondary to the mandates of the institutions within which they work. The demands tabled by the BWF included the demand that organisations in the sector ought to develop transformation plans, succession plans, and practice transparency with regard to the salary scales of its own employees; that briefing policies be aligned to ‘transformation’ imperatives, and that there be cultural and gender sensitivity training provided to staff and management. Whilst some regarded the call from the BWF as an unnecessary disruption of the important work conducted by the sector, there were those who were sympathetic and listened. The work of the sector is a noble one, but a call for internal transformation can unsettle organisations who, albeit committed to the cause, have conducted very little self-reflection on their own institutional characteristics which tend to perpetuate social injustice. The transformative agenda of the BWF was not filled with the human rights language, ‘the deification of transformative constitutionalism, and the veneration of civil society’, instead, it was located within an emancipatory political discourse. This emancipatory politics was grounded on a call for ‘participation of blacks in the articulation of their aspirations’ in the sector. At its best, it invoked the resurgence of a black activist movement and political agency in a sector where hegemonic whiteness is associated with both the oppression and liberation of blacks. Whilst the BWF activism has diminished over the past year or two in holding the public interest law sector to account, its philosophical foundation still compel us to find a place for emancipatory politics in the social justice praxis of the sector. This was the historic mission of the BWF, to consider where opportunities for mutual benefit exist. We propose four opportunities which both donors and public interest law centres should prioritise. Firstly, the sector should look at ways to deepen the participation of poor communities and individual activists. Consideration should be given to including community activists on the boards of directors, placing them on the same level as white directors. Research, advocacy, public interest litigation and legal education should be all be led bottom-up. This would alter the client-professional-relationship that is so unequal. Proactive steps should be taken to align organisational strategies with community strategies and conflicts of interest should be addressed. Public interest law centres should be located in black townships or steps should be taken to build a community-based-public interest law centre whose model of resilience is measured against continuing community support and ownership. Centres should not be seen as spaces to acquire “help”, but rather spaces of partnership around ideas of social change and emancipatory politics. Donors should be striving to support this communal sense of partnership, not basing their decisions to award funding solely on the basis of the profiles of particular leaders. Donors should monitor and evaluate the presence of resilient systems, the execution of the organisation’s mission, the strengths and weaknesses of organisations and adopt a zero-tolerance policy on gate-keeping, paranoia and toxic networking relationships. Secondly, leadership should be evolving, transformative, transparent and incorruptible in its dealings with internal staff and the public at large. Centres should have succession plans in order to allow for ease of transition. Black women should be encouraged to take leadership positions. Leadership should be transparent and democratic in the design and implementation of policies relating to private work outside of an organisation. Staff must be assisted to reach their full potential through staff support and development. Black workers must be able to imagine and achieve professional growth in the sector. The realities of spatial injustice and the black tax must be considered in the salaries of black workers. Organisational policies should be developed and reviewed by everyone in the organisation and staff should have regular workshops. Thirdly, especially on seminal and high profile public interest cases, public interest law centres should be deliberate in their inclusion of counsel who are black women, black men, white women, those who identify as LGBTQIA+ and those living with disabilities. The legal teams litigating on behalf of these centres in the Supreme Court of Appeal and the Constitutional Court, must be a genuine reflection of the commitment to social justice and substantive justice within the sector. This is crucial in order to change the silent messaging that black people, people living with disabilities and other marginalised groups, are inferior to the able bodied, heteronormative white people in the sector. Fourthly, organisations with specific projects in hand on land reform should have gathered to coordinate their strategies to meaningfully consult the state and transcend their competitive urges in making submissions on the land debate. What is disappointing is that most public interest law organisations that made submissions did not consult their staff before they submitted. The list of demands made by the BWF in 2016 also called for land reform programmes that are funded to address land redistribution and reclamations and the ‘urgent emancipation from the repressive structures and attitudes of oppression found in civil society institutions’. This was because the lack of consultation was a fundamental blunder in a sector where black people constitute the majority. It was also an assault on the BWF’s emancipatory, transformation agenda, in that it rendered black workers in the sector invisible and unintelligible in the articulation of this aspiration. The effect of this is intellectual exclusion, and it only perpetuates the patronising idea that black people cannot adequately articulate the relief they seek in their own lived struggles. This proposal requires immediate implementation. We as black workers have a long way to go in the fight for equality in the sector. One of the reasons for continued tensions insofar as the transformation agenda and emancipatory politics is concerned, lies in the fact that black workers are continuously relegated to playing a supporting role in the development of solutions for black struggles. There are still opportunities for change, and the four listed above are by no means exhaustive. But they are a start, and hopefully they do not fall on deaf ears.